We’d love your help. 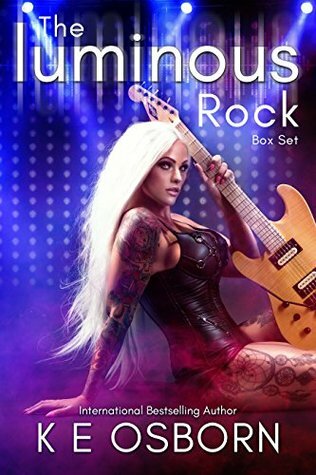 Let us know what’s wrong with this preview of The Luminous Rock Series Box Set by K E Osborn. Working for the all-female rock group, life should be a breeze though it’s anything but. What with me leaving someone behind in a life and death struggle, Effa having difficulties with backing band stalkers, Thump. Working for the all-female rock group, life should be a breeze though it’s anything but. What with me leaving someone behind in a life and death struggle, Effa having difficulties with backing band stalkers, and general on the road drama, our lives together are anything but normal. Lines are blurred, jealousy flares, times are tense, and revenge is best served cold. Effa sets my pulse racing, and she's going to change everything. To ask other readers questions about The Luminous Rock Series Box Set, please sign up. This series was amazing I couldn't put it down and if I could have given it more than five stars I would have. I will definitely be recommending it to friends and I can't wait to see what's next from this author.